Many of us suffer from the problem of yellow nails. It occurs among both men and women, and can be a source of embarrassment. Most commonly, yellow nails are caused by nail polish. The pigments used in nail polish, particularly darker shades, can stain your nails over time. The best way to prevent this from happening is to always use a clear base coat before applying your favorite shade of nail polish. 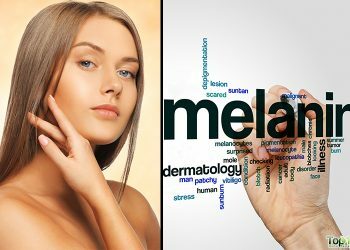 Other causes of nail discoloration can be a fungal infection, chronic liver disease, excessive smoking and poor lifestyle habits. 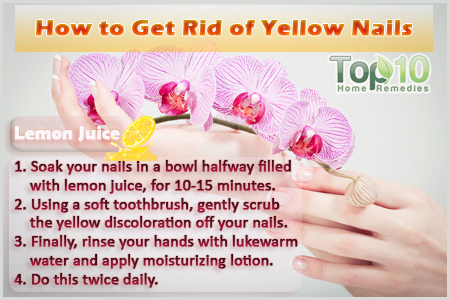 There are some home remedies to get rid of yellow nails that are very effective. 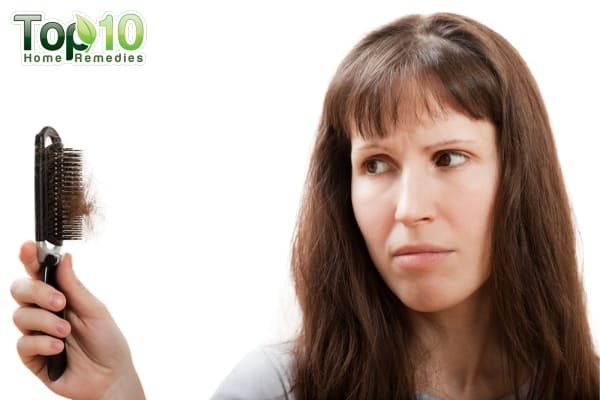 Here are the top 10 ways to get rid of yellow nails. Lemon is a natural bleaching agent and can effectively clean off yellow stains from your nails. Plus, lemon juice also works as an astringent. Fill a bowl halfway with fresh lemon juice. Soak your stained nails in it for 10 to 15 minutes. 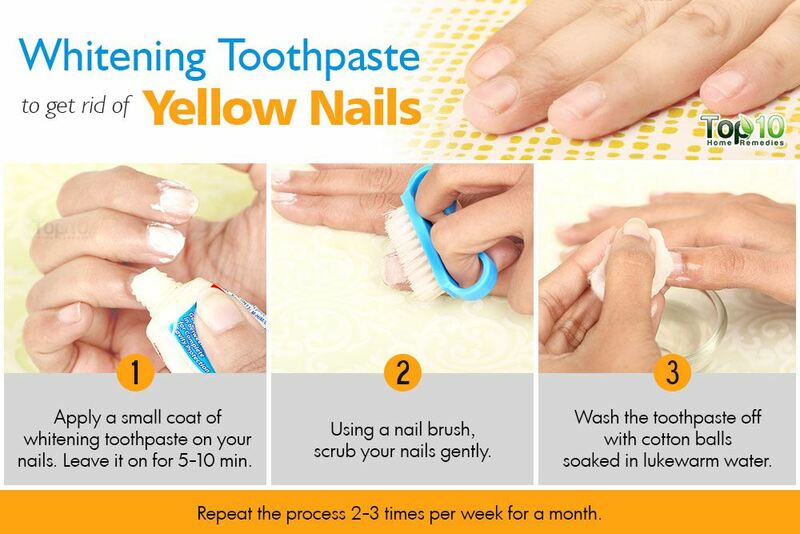 Then use a soft toothbrush to gently scrub the yellow discoloration off your nails. Finally, rinse your hands with lukewarm water and then apply moisturizing lotion to replenish valuable moisture. Do this twice daily until you are happy with the results. Alternatively, you can use lemon essential oil. Pour some lemon essential oil into a shallow bowl filled with water and soak your fingertips in it for several minutes. Then scrub your nails with a soft toothbrush for one or two minutes. Repeat this process twice daily for a few weeks to whiten and brighten your nails. 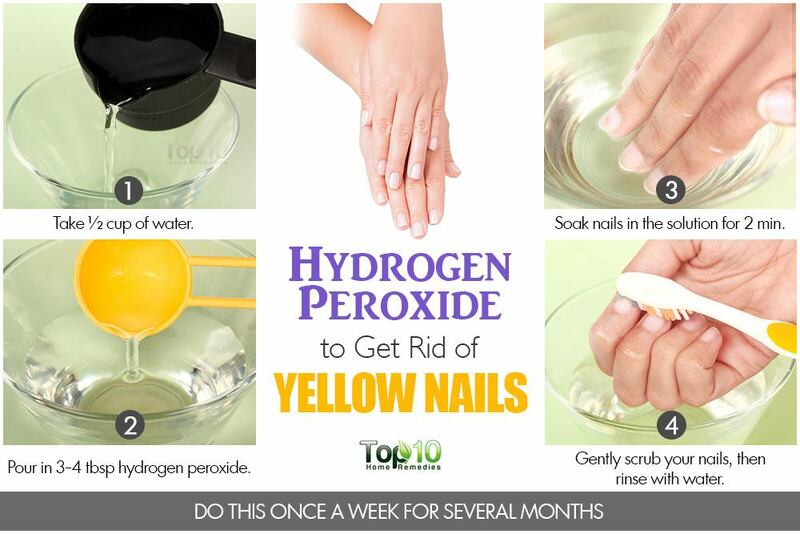 Hydrogen peroxide has whitening properties that work wonders on yellow stained nails. Be sure to use a solution that is only 3 percent hydrogen peroxide. 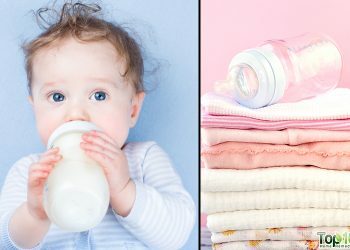 Pour three to four tablespoons of hydrogen peroxide into one-half cup of water and mix them well. Soak your nails in the solution for two minutes. Using a soft toothbrush, gently scrub your nails. Then rinse them with water. Do this once a week for several months. For stubborn stains, apply the hydrogen peroxide directly on your nails and lightly scrub them with a soft toothbrush. Hydrogen peroxide can dehydrate your nails, so apply a moisturizing lotion after using this remedy. The bleaching and exfoliating properties of baking soda can help remove stains from the nails. Mix two and one-half tablespoons of baking soda and one tablespoon of 3 percent hydrogen peroxide in a small bowl. Use cotton swabs to apply the mixture on the stained nails. Leave it on for three to four minutes and then rinse with lukewarm water. Repeat this process every six to eight weeks. Mix one tablespoon of baking soda, one-half teaspoon of olive oil and one teaspoon of lemon juice to make a thick paste. Rub the mixture on your nails using a soft toothbrush. Leave it on for about five minutes, and then rinse it off with warm water. Repeat this remedy every two weeks. Toothpaste that helps to make your teeth whiter can also be used to remove yellow stains from nails. 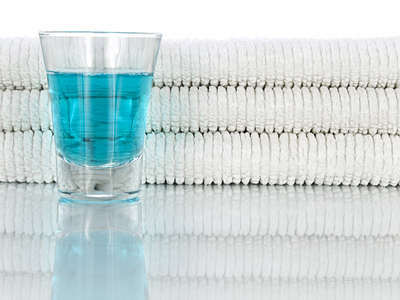 For mild stains, you can use toothpaste that contains any whitening ingredient including hydrogen peroxide. Apply a small coat of whitening toothpaste on your nails. Leave it on for five to 10 minutes. Using a nail brush, scrub your nails gently. Wash the toothpaste off with cotton balls soaked in lukewarm water. 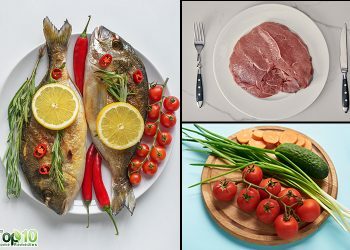 Repeat the process two or three times per week for a month. Another effective ingredient for stained nails is denture cleaning tablets. The two most common ingredients found in denture cleaning tablets are sodium bicarbonate and citric acid, which help remove many kinds of stains. Dissolve two or three denture cleaning tablets in a bowl of lukewarm water. Soak your stained nails in the water for 15 minutes. Pat your nails dry and apply some moisturizer on your hands. Repeat this process three times per week for one to two months. 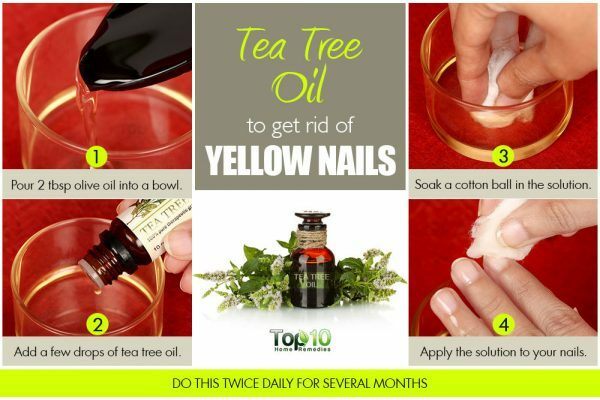 If your nails are yellowing due to some kind of fungus-related infection, tea tree oil is the best home remedy to try. Tea tree oil is a natural fungicide and has antiseptic as well as antimicrobial properties that will help fight infection and restore the natural color of your nails. Apply pure tea tree oil to your nail beds using an eye dropper. Leave it on for a few minutes, and then rinse it off with lukewarm water. Do this twice daily for several months until you notice improvement. Mix equal amounts of tea tree oil and olive oil. Apply the solution to your nails using cotton balls. Do this twice daily for several months. The malic acid and acetic acid present in apple cider vinegar will help reduce discoloration of the nails. It also has antifungal properties that will help treat any kind of nail infection that causes discoloration. 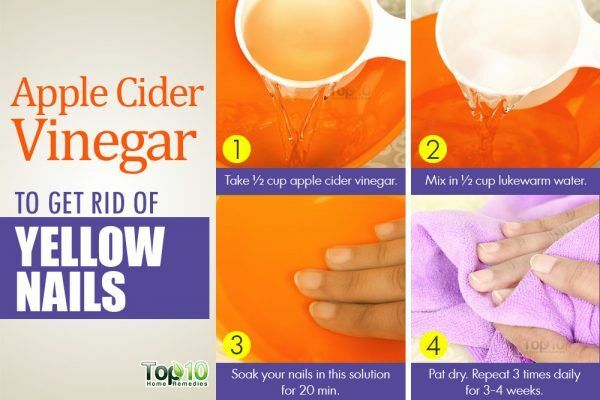 Plus, apple cider vinegar will help strengthen and stimulate nail growth. Mix one-half cup each of apple cider vinegar and lukewarm water. Soak your nails in the solution for about 20 minutes. Pat dry your nails thoroughly with a soft towel. Do this three times daily for three to four weeks to treat the infection as well as reduce discoloration. Listerine is another effective treatment for discolored nails caused by fungal infections. It contains active ingredients like menthol, eucalyptol, methyl salicylate and thymol that are all rich in antifungal properties. Soak the infected nails in 100 percent Listerine for half an hour. Do this daily for a week, take a break for one week, and then repeat the following week. The skin around the nails may turn green but it will disappear on its own within a few days. Alternatively, mix equal amounts of Listerine and vinegar. Soak the affected nails in this solution for half an hour. Repeat daily for a few days until you see positive results. 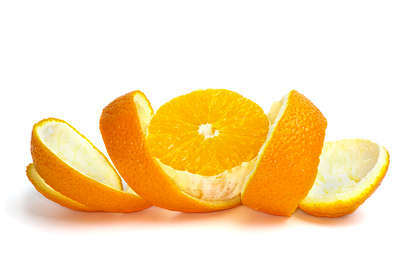 The high amount of vitamin C present in orange peel will help remove yellow stains from your nails. Rub your nails with fresh orange peel two or three times daily. Within a few weeks, you will see effective results. Mix two tablespoons of dried orange peel powder and a little water to make a thick paste. Apply the paste on your nails and leave it on for 10 minutes. Use a soft toothbrush to remove the paste from your nails and then wash them with lukewarm water. Follow this remedy twice daily for one to two weeks. 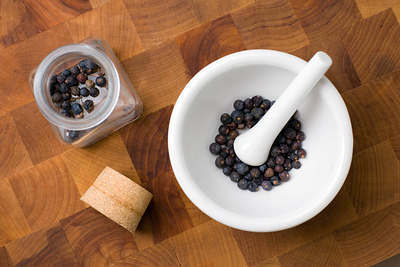 Juniper berries act as a strong disinfectant and can effectively treat discolored nails caused by a fungal infection. Add one teaspoon of crushed juniper berries to a bowl of warm water. Soak your yellow nails in it for 15 minutes. Rinse with lukewarm water and apply some moisturizer. Follow this remedy once daily before going to bed for several months. After using these remedies, you’ll be ready to flaunt your beautiful nails. However, if you do not see positive results, it is best to see a doctor. Yellow nails can be caused by an internal disorder that may require medical care. My wife has a fungus on one of her toenail.NO remedy helped.She ıs sufferıng nearly for 3 yearsç.How can we heal ıt with a home remedy.WHAT wil.Wil garlic ..white vinegar. and bakıng soda be helpful.Or can we add olıve to them? My mom has a fungus on her toe nails. The dr. told her to use Vaseline and it has worked. She rubs it on in the morning and at night and it is growing off. She reapplies several times a day on her days off. I think the person means Vicks Vapor Rub. I have toothpaste on my feet! See if this works then! My husband sees a podiatrist. His nurse suggested Vicks on toes and feet and wear socks to bed. It’s amazing…cleaned my dark nails from a fungus on my toenail! Gonna see my results. ? How odd I ran across this, I actually just advised one of my own patients to do this very thing this week. Apply Vicks Vapor Rub to affected toe(s) 1-3 times daily and more often if home on the weekends and wear socks to cover. I will try Vicks as well. I have a place on my big toe that is starting to turn yellow. Going to try this….thanks! Does this also work with toenails that are thickening?